One of the nicest aspects of being in Hendricks County -- whether a resident or visitor -- is the the parks and trail system that flow throughout the county. On June 14, many visitors and families alike will be out to have some fun in the sun, but there will be another large tribe to share the parks with that day -- those running in the 45-mile Park2Park Relay. 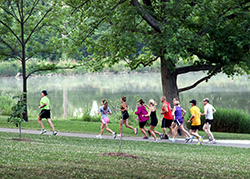 The lengthy race is an annual fundraising event for the Parks Foundation of Hendricks County, and is one of the ways the foundation makes money to keep the parks in such beautiful, working order. This relay race is for the diehard runners and space is still available. It begins in Sodalis Nature Park in Plainfield, on the southeast side of the county, and eventually winds up at McCloud Nature Park in North Salem. The race includes 12 legs, each 3-5 miles long. According to the foundation, the typical team (and, you don’t have do be part of a team if you choose to be an Ultra Marathon Runner) includes four members who will run approximately 11 miles each. How those teams are broken up matters. Whatever the configuration of the team, they are part of a division: Male/Female, Mixed (2&2), Masters Male/Female/Mixed (all members are part of the over-40 crowd), Open, Corporate, and Ultra Marathon (those brave souls who plan to run 45 miles ALL. BY. THEMSELVES.) And of course, there is a division for those runners who are just slightly-less-devout than the Ultra Marathon types: Zealous teams, with 5 or more members. You know, for people like me, who would show up with a church group of 45 just to be able to participate without asking for an asthma attack. The staggered race begins at 6 a.m., and continues in a steady stream (slower teams first, fast teams last) throughout the parks until 2 p.m. So, if you’d like to come see the runners in action, assuming you aren’t one of them, morning and early afternoon is your chance. In fact, friends and families of runners are encouraged to come and cheer them on, and enjoy for themselves the very park system the runners are indirectly helping. Those interested in doing a bit more for Park2Park Relay and their favorite runner can volunteer in a variety of ways (set-up, timing, spotting, keeping runners and spectators safe from traffic, etc. ), and will be thanked with snacks, t-shirts, and other prizes. For more information on volunteering, send an e-mail to volunteer@park2parkrelay.org. Any additional information regarding Park2Park Relay (how you can REGISTER -- alone or with a team -- if you’ve not already done so, how you can help, where to be to watch) can be found at this website or by sending an e-mail to RaceDirector@Park2Park.org. A four-generation resident of Plainfield, IN, I have, and continue to work in education, music/theatre and languages (about.me/Angela.Smail). My husband, Chris (www.CoolidgeTheBand.com) and I enjoy traveling, eating local, and sharing all the events Hendricks County has to offer with our sons. All four of us anxiously await baby #3, due this fall.